Despite the fact that Oklahoma’s wedged between plenty of other states, it didn’t gain statehood until 1907. 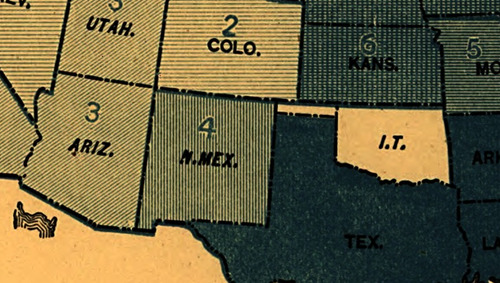 Before that, it was known as "Indian Territory,” labeled I.T. on the map above. The US Government slowly pushed Native Americans into a smaller and smaller area - at first “providing” them all the land between Oregon and Missouri, then picking away bit by bit until left with modern-day Oklahoma. By 1890, they’d even split it down the middle, giving settlers the western half (Oklahoma Territory) and Native Americans the east. In 1905 the inhabitants of Indian Territory applied for statehood as the State of Sequoyah. Teddy Roosevelt and Congress gave it the thumbs-down, admitting the combined Indian and Oklahoma Territories as the state of Oklahoma only a year or so later.